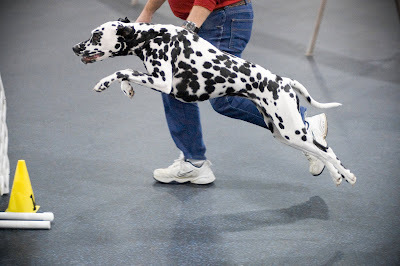 I'm so proud to report that Tess has once again been named one of the Dalmatian Club of America's Top Spots for Agility for competition during 2009!! This year -- drumroll, please -- Tess was ranked #1 in Open Standard and #9 in both Excellent A Standard and Excellent A Jumpers with Weaves. This is for AKC competition only and does not include her many accomplishments in CPE, USDAA, and NADAC. Big congratulations to Tess and her awesome handler, Jim!! These two embody all that agility should be...building a relationship with your dog and having FUN. Tess and Jim continue to grow as a team and we look forward to their continued success in 2010! We're heading out early tomorrow morning for Valentine's weekend at a USDAA trial. Not exactly spine-tingling romance, but, hey, it's what we like to do! Anyway, since we won't be home to post on Valentine's Day, we decided to send our Valentine's greeting to all our blog friends a little early. Tess and Jazz hope you all have a Valentine's Day that's way cool!! We had quite the snowstorm last evening, dumping more than 20" of the white stuff on us overnight! The first thing we had to do at 5:30 this morning was shovel the yard so the girls could go! It's hard to tell from these photos, but the snow is higher than Tess and Jazz! Tess is 22" at the withers, and if she jumps in the snow, all that shows is her head! Here's Tess and Jazz trying to dig an escape tunnel. The snow is so high that it's like a natural dog fence! Tess is sure the yard is under there somewhere. Agility, anyone? The blue poles sticking out of the snow are our jump standards. The bar set at the 20" jump height is not even visible! You can also notice how much of the dog walk is buried. Something tells me that the girls won't be running this course any time soon!